Finally, a worthy start to a new season! NCIS: Los Angeles can still do it, when their sister shows have been weak. We left them on a cliffhanger, but that’s not always a guarantee. This didn’t disappoint, and the suspense kept growing. You knew they’d have to survive, but it started to look decidedly impossible. It was taught on all fronts; the ladies over Deeks, Hetty’s future, the victim with a fondness for whisky, Nell and Eric, as well as a certain tension on board that sub, both for our agents and the terrorists. If this had been for real, Callen and Sam would probably have died, or at least not come out of it quite as rosy, but is is fiction. It’s allowed to end well, or we’d not have much of a season to look forward to. Keep up the good work! Maybe even share some of your writers with the other two shows. They need it. Hmm. That was a bit of a disappointment, after having enjoyed the NCIS: New Orleans trial episodes in season 11 of NCIS. A first ‘real’ episode needs to try really hard. Don’t try and tell us what a wonderful man Pride is by having one of his friends murdered. And the victim’s poor father might have been distraught, but soon cheered up enough to compose some music, with Pride joining in on the piano. Unrealistic, and I prefer my agents not to be jack-of-all-trades. Pride is Gibbs, minus what makes Gibbs special. I still like Brody and LaSalle, as well as Dr Wade (even when they have gone out of their way to make their ME female and black). I could easily lose Sebastian, though. Wise move to have Ducky join in, even if it was on screen only. The team is small. 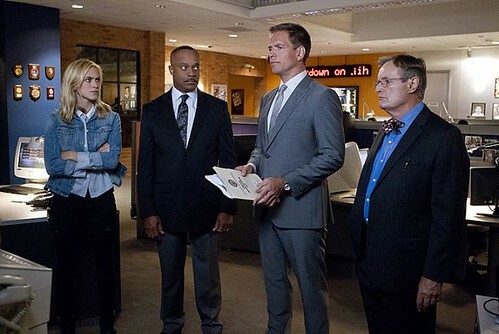 Gibbs started out with a similarly small team, so I wonder if they will recruit more agents if the show is popular? The setting is great. Maybe just take it nice and slow and not throw all that is New Orleans at us straight away? Looks like someone has something to prove. Old enemies are the best. They could be dead, but still good. So, start of season 12 of NCIS. What do we think? It was OK. Not the best we’ve seen, nor the worst. I can sort of see where we might go with this, whether long term or merely for the next week or two. Although I really do need to grasp the Rock-Paper-Scissors thing. It still fails to make sense. Nice to see everyone there for the first episode. And I did find that Kevin character suspicious looking last time, but still don’t know what to make of him. Intentional? Or just using someone again? The Finnish/Russian forest looked awfully sparse and light. Also DiNozzo must have taken up apparating. And why rely on a minor agent getting favours from another agency? Surely in times of real need someone like the director of one agency could ask for help from one of the others? Small quibbles, though. It was OK. No funny lines that I recall. 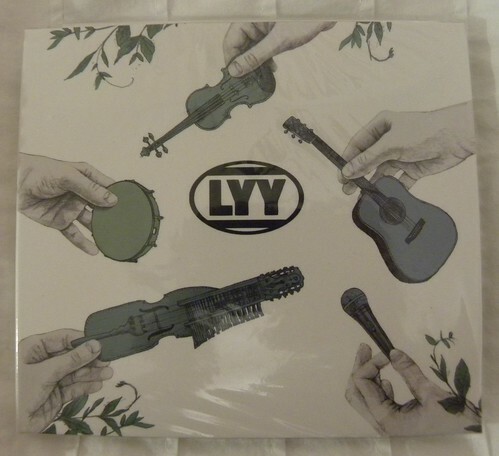 Never having heard of Lyy until two weeks ago, I nevertheless decided to take the Resident IT Consultant and go and hear them. Seeing as they are Swedish, and seeing as they were coming to Stirling (after a weirdly coincidental concert at the Nordic church in Liverpool earlier in the week), I felt it’d be wrong not to. Didn’t even properly realise Stirling had a fringe, nor that it’s pretty new. Before them we listened to the Jailhoose Trio, a very newly founded local band. Unless I misheard, this was their first gig. I reckon there will be more, as they were pretty good, with some nice tunes and their singer had a fine voice. There was a reasonable number of people in the audience. And one dog. I hadn’t been in for 22 years, since the Resident IT Consultant’s cousin got married there. Somehow it had shrunk, or else my memories of it had made it bigger than it was. Still nice. 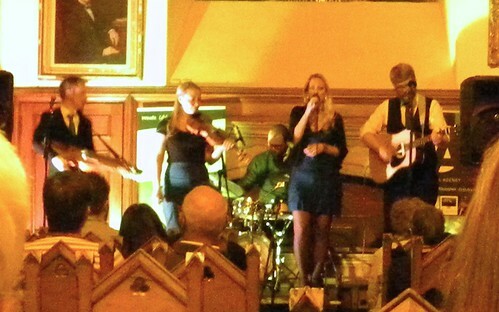 So, it was a good place for a Swedish folk group to play. Being old, I’d say folk with some pop, as it was louder and less folksy than what we had in the olden days. Very nice, though. The songs were all about love, in one form or other. And the one about sleeping, standing up. Their guitarist went through strings like there’s no tomorrow. Their singer almost went through the floor, or at least her high heels made more contact with the holey stage floor than she had expected. 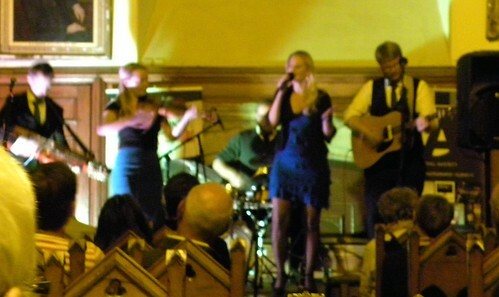 The audience loved them, and we got two encores before we were encouraged to buy the CDs. They needed space for whisky on their return journey, or so they said. I bought a CD. There were download codes for £5, but at my age you need a proper disc. Find them on Facebook, and/or go and listen to them if you get the opportunity. Happy 81st Birthday, David McCallum! It’s interesting to think that today is the first day in the life of a new Scotland. Whatever the referendum results are, we will never be the same. Today is also the start of Bloody Scotland, the crime festival in Stirling. Quite suitable for the amateur pathologist, with plenty of professional murderers and a fair bit of forensics, too. 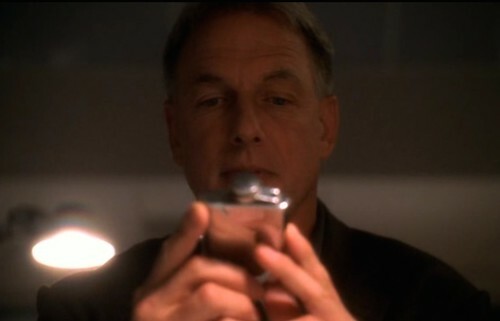 Here’s to the new season of NCIS, starting next week, and to David who continues to work when others wouldn’t. It says #1 drama in the world on that cake. I’m beginning to feel I live in another #1 drama, with all that’s happening in David’s country of birth. Let’s hope it goes well, for NCIS, and for Scotland. I have held back on saying anything about the new Doctor Who. Not the man himself; I reckon Peter Capaldi will do as well as most of the others. And Clara remains Clara, whatever we think of her. But I’ve not been 100% sold on the first couple of episodes. OK if you want to watch something, but not stirring stuff. Not that Doctor Who has to be all that special. It’s only a television programme, after all. But occasionally they start off with a gem, getting viewers excited, before it fizzles out. This time it took three tries before they got anywhere at all, but looking at social media I see most people found last night not terribly good. Oh, well. We can’t all be the same. Which brings me to the serendipitous moment we finished with the Doctor and ended up with Last Night of the Proms, Glasgow version. We joined just as Katherine Jenkins sang about a union, before going on to sing it was time to say goodbye. Both excellent songs. Neither of them on the programme by mistake, I imagine. Ever the turncoat, I stayed on for the second half from Albert Hall, although reading a book at the same time, so as not to pay too much attention to south of the border. I do actually like those ‘contentious’ pieces of music, traditionally played at the end. Not because of what they supposedly stand for. They just sound good. You can hijack anything for any purpose. I first heard Land of Hope and Glory on a television programme about the Empire, many years ago. I loved it. I had no idea what it stood for, and thought it was something they had arranged for the programme. I think that’s the thing about coming fresh to stuff. You have none of the emotional baggage people who were born to it do. So I like Elgar, and not for any empire or union or political party or anything else. Nor do I believe Holst would have wanted to support the Yes campaign, but I see no reason not to use his music. It’s a wonderful piece, and the ‘coincidence’ was quite amusing. As was Sakari Oramo as conductor. I thought this supposedly silent Finn would never stop talking! But his outfit was nice. And so was his smile at the end, as he watched his audience sing Auld Lang Syne. Besides, Doctor Who is Scottish. And he’s not the first one, either. Mark Harmon is 63. Some people retire then, but I’m thinking he might continue the Gibbsing for a while longer. We don’t know (or do we?) when Gibbs’s birthday is, except it happened in episode eight season three. Here he is, celebrating all alone. This year we are forcing the Grandmother to observe her 80th. There will be cake and a few scones. No candle, but lashings of tea and whipped cream. And let’s hope we can abstain from singing.